The title of this plan features at top right, with compass star at middle right and explanatory note at bottom right. The boundaries of the St George parish are outlined in red, with the properties in the estate in pink, and parks and open spaces in green. 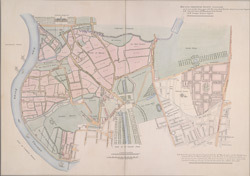 The plan shows the proposed new street plans for Grosvenor Square, but not the Chelsea waterworks, which featured in the original drawing from which this print was produced.